The Pere Marquette is an extremely popular river for canoeists. The moderately fast current, the clear water, the low degree of stream bank development, have all helped to make this river a mecca for those who canoe or kayak. No permit is needed to enter the river...which is open to paddlers from 9am-6pm. We suggest you contact Pere Marquette Expeditions for kayak and canoe rental. The Pere Marquette River has daily watercraft limits, and from Memorial Day-Labor Day, you must have a permit to enter the river...which is open to paddlers from 9am-6pm. A daily permit is available by calling the U.S. Forest Service at (231) 745-4631, or at the Baldwin Ranger District Office. Cost is $2.00 per watercraft...and you must obtain the permit for the particular section you wish to paddle. If you allow two weeks time, a permit can be mailed to you before your arrival at the Pere Marquette River. The Forest Service also charges a $5 daily parking fee at their access sites. You may also obtain a $15 weekly or $30 annual fee. 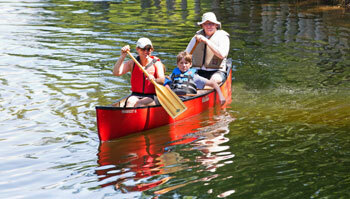 When you rent a canoe or kayak from Baldwin Canoe Rental, your permit is included with the price of the rental. For more information regarding permits, contact the USDA Forest Service. Commercial canoe liveries are well established on the mainstream. 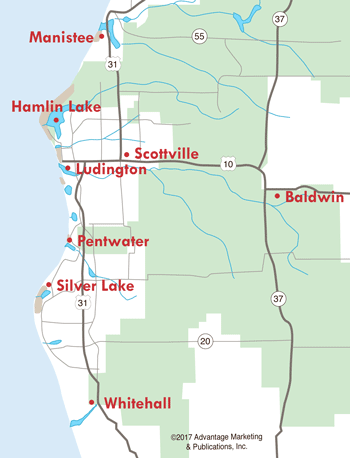 In Lake and Mason counties there are approximately 730 rental canoes available. Of this figure, approximately 450 were located on or near the immediate area of the Pere Marquette River. Over half of the use is by organized groups who tend to travel in parties. Most of the use occurs on weekends, with Saturday being the most popular single day. 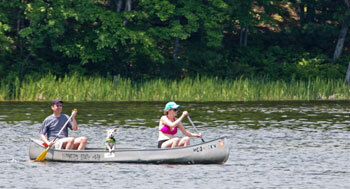 Few trips are more than one day, with four to six hours being the most popular canoe length. Most canoeists are inexperienced and many are first-timers. Use is concentrated from 9:00 am to 7:00 pm. Use season is from late May to October. Boating with motors is concentrated from Indian Bridge to the mouth. Such boating is usually concentrated with fishing rather than pleasure boating and most often occurs during the spring and fall and steelhead and salmon runs.